Our wines originate from the chardonnay Dijon clone 76 and 96 vines in our original estate plantings in 1998-1999. Intended for true connoisseurs of great chardonnays, our wines are made from individually selected clusters of grapes, are aged in New French oak for 10 months or more, and can be cellared for 10 years or more. Each bottle offers a chardonnay taste experience nonpareil. When we took our first taste of the first barrel of wine ever made from our chardonnay Dijon clones 76 and 96, it was nothing short of pure enchantment. The wine’s intense flavors of tropical fruits and stone fruits are complemented by a wonderfully spicy finish. We expect this wine to be ready to please the palettes of chardonnay connoisseurs around the world beginning in late 2015. Only 24 cases produced. The 2014 growing season that produced such stunning pinot noirs in our vineyards performed no less a miracle in our chardonnay vineyards. The two Dijon clones 76 and 96 that grow side- by- side in our vineyards melded into a truly remarkable chardonnay after 10 months in new French oak barrels. 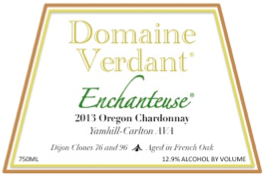 A tour de force of tropical fruit and spice flavors, we believe our 2014 will be a landmark Oregon chardonnay — a wine for true chardonnay connoisseurs. 45 cases produced.